Our menu is inspired by Chef Jay-Ar Pugao's mother, Rebecca Pugao. Her loving hands and adept skills in the kitchen have nurtured our family for years. We hope to bring a similar wholesome experience to you, our customers. Traditional rice noodles cooked in vegetable broth, combined with thinly sliced soy chicken, cabbage, celery and carrots, then seasoned with pepper, soy sauce and lemon juice. The most popular dish of the Philippines! Soy chicken strips fried to a crisp, combined with soft eggplant then cooked in a marinade of soy sauce, vinegar, bay leaves, garlic, salt and pepper. A stew-like combination of soy chicken, potatoes, red bell peppers and green peas melted into a tomato based sauce. Mung beans boiled in broth then combined with sautéed kabocha squash, string beans and deep fried tofu. Soy beef strips sautéed in onions then coupled with string beans and broccoli for a crunch, cooked in soy sauce and a splash of fresh lemon juice. Deep fried soy fish covered in a thick sauce of sautéed tomatoes, onion, crumbled tofu, soy sauce, pepper, and a touch of lemon juice. A hearty rice soup cooked in vegetable broth and ginger with fried soy chicken strips. Soup for the soul! Seasoned soy ground beef mixed with shredded cabbage, peas and carrots hand rolled with an eggless rice wrapper, then deep fried to perfection. Sweet chili sauce for dipping! No Worries has provided the Bay Area with different services for over 15 years! Whether it's catering your next event or your organization needs a live cooking demonstration on healthy cooking, Chef Jay-Ar Pugao has the experience necessary to ensure a smooth, informative, and enjoyable time. The catering service can be done with or without the food truck depending on the type of event. 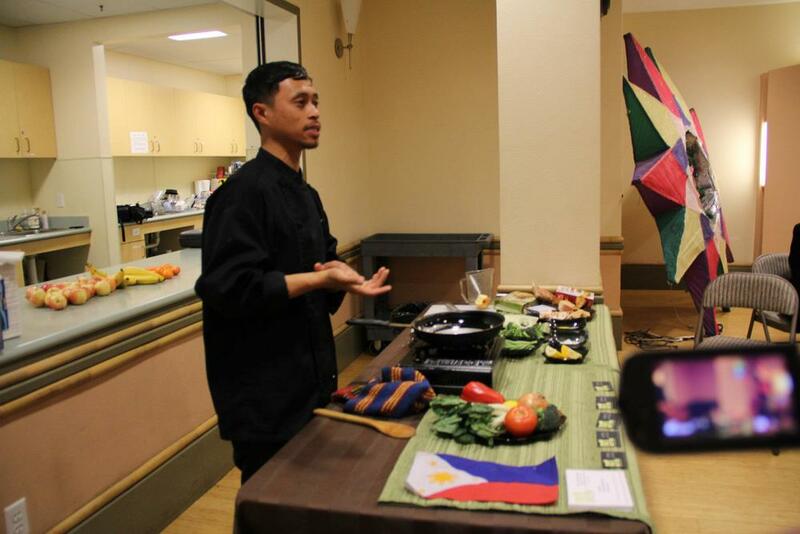 Chef Jay-Ar can find comfort in any kitchen, in any home to prepare his original recipes of Filipino vegan cuisine or a variety of vegan/vegetarian dishes. The Chef will bring everything he needs to make your meal, including cooking equipment and ingredients. This service is most suitable for private events for small parties and private vegan home cooking instruction for families. The Chef will see it through that your experience is tasteful from the food preparation to the clean up process! We'd love to talk details to help you figure out what kind of service you need. Soy shrimp marinated in lemon juice and soy sauce, covered in eggless batter, then deep fried to a crispy golden brown! Elbow pasta boiled in soy milk and vegetable broth, joined by shredded soy chicken, celery and carrots. Kids love it! Hot, thick broth with spears of asparagus and pieces of soy chicken, this soup is great as a starter or stands alone! Soy chicken sauteed in ginger and garlic, then joined by hot vegetable broth, delicate chayote and broccoli. Light and delicious! Soy ham cut in cubes and sautéed in garlic, onions and tomatoes, coupled with cubed potatoes, garbanzo beans and raisins. Soy meat, eggplant, string beans and cabbage boiled in hot broth and then cooked into the traditional peanut sauce of the Philippines. Unique and great tasting! Soy fish sauteed in ginger, black beans and mushrooms with fresh bell peppers added, Simple and scrumptious! Soy ground beef sauteed with garlic and fried potatoes complimented with peas carrots and red bell pepper.